How many Halloween pumpkins have I thrown over the fence through the years? Sure, the raccoons and squirrels loved them, but at some point, I decided it was a waste. I bought pumpkins for Halloween and then bought canned pumpkin for Thanksgiving pies. It was like paying for the pumpkins twice. Once I arrived at this realization, I started shopping for Halloween pumpkins with an eye toward pie. The owner of a small local farm suggested small sugar pumpkins, goose neck pumpkins, or small white pumpkins. As long as they are in good shape and not carved as jack-o’-lanterns, they can be used for pie. I don’t know about you, but I like to multi-task. Combining cooking projects with reports and statistics seems to improve my results on both. It could be an example of brain lateralization, if you believe in that sort of thing. Hey, what if baking pumpkin is good for your brain? Avoid using carved pumpkins, like the one pictured here in the middle. Okay, let’s cook pumpkins. Preheat the oven to 350°. Cut off the top of the pumpkin (as you would for Halloween carving) and scoop out the seeds and mush. Save the seeds! They’re brain food! 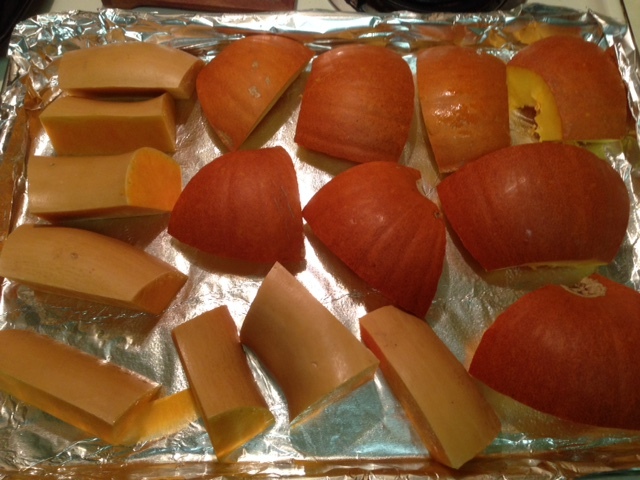 Cut pumpkin into manageable sections. Cover a baking sheet with foil and spray the foil with cooking spray. Place the pieces of pumpkin, cut side down, on the sheet. You can fill the pan without leaving too much space between pieces. It doesn’t affect the baking time. Bake for 45-50 minutes or until fork-tender. When the pumpkin is ready, take the tray out and let the pieces cool while you prep another tray (for those of you making big batches for freezing). The skin can be peeled away or the pumpkin can be scooped out of the skin and placed in a food processor. 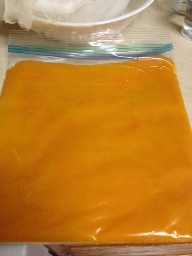 Puree the pumpkin and use right away in your favorite recipe or store in plastic freezer bags. I measure 2 cups per plastic bag, which is enough for most recipes. Two sugar pumpkins and one goose neck pumpkin results in 4 freezer bags (8 cups) and one extra cup that comes in handy for a quick bread recipe. Here’s a little trick I learned from The Pioneer Woman, Ree Drummond. 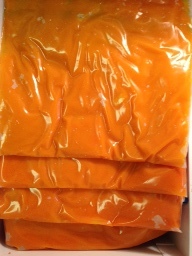 After filling a freezer bag, lay the bag on its side, making sure the pumpkin puree sits firmly in the bottom of the bag, smooth the pumpkin out toward the seal, pushing air out as you go. When it gets near the top, seal the bag. The bags will lay flat in the freezer and the pumpkin will thaw faster when you need it. 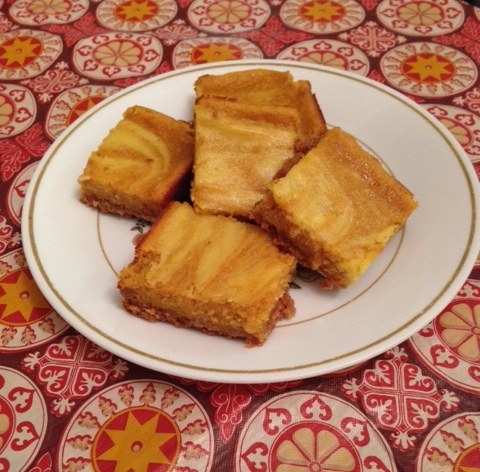 Instead of making a traditional pumpkin pie, I made Pumpkin Swirl Cheesecake Squares using a recipe from the Canadian Food Network. I won’t repeat the steps here, but I will share a photo of the results. Article & photos by Luisa Cywinski, writer for the Communication & Service Promotion team and team leader of Access Services. 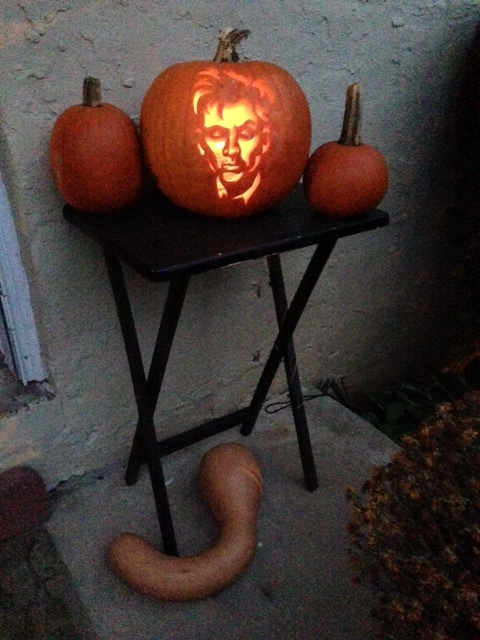 Jack-o’-lantern carved by Michael Miller-Cywinski.